New football stadium in Craiova is delayed yet again. And it seems like it won’t be the last time because it doesn’t look like ending in half a year. Construction of the new Ion Oblemenco stadium in Craiova is moving forward but hardly at the pace it was expected to have. The stadium was first expected for delivery in November 2016, then in February 2017. Now the deadline was shifted yet again, this time to June 2017. According to Ziare.com the delay is still greater than 4 months and delivery in June is an illusion. Judge yourselves, this article’s photos were taken by Craiova’s mayor Lia Olguta Vasilescu this Wednesday. Indeed, it’s hard to believe in the new date being realistic. Why the growing delays? First cause given in early 2016 was the previous winter though it wasn’t too harsh. Then in summer lack of qualified workers was named as the issue and now again winter is said to be causing work to slow down. But as Ziare.com points out, it’s only been snowing in Craiova for a week. Regardless the reason, another passed deadline might prove costly for local team Universitatea. They’re now third in Romania’s top tier and still have chances to become the next champions. If they keep a spot around the top, in the summer they will be playing European games. Where? One unlikely option is their home city, unless the construction speeds up. 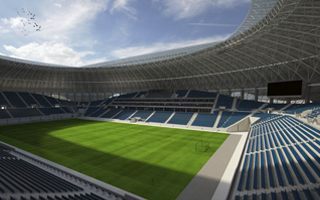 The new Ion Oblemenco stadium will hold just over 30,000, which makes it the largest sports project currently ongoing in Romania. It’s expected to cost €50-55 million.